Polk appointed William Marvin as the first judge for the United States District Court for the Southern District of Florida. Following is a list of all United States federal judges appointed by President James K. Polk during his presidency. In total Polk appointed ten federal judges, including two Justices to the Supreme Court of the United States, one judge to the United States Circuit Court of the District of Columbia, and seven judges to the United States district courts. 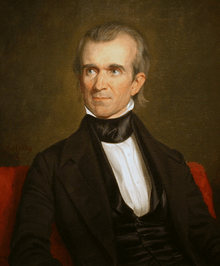 Polk faced some obstacles in seating Justices on the Supreme Court. After Henry Baldwin's death in April 1844, Polk nominated James Buchanan for the seat, but Buchanan declined the nomination. Polk then nominated George Washington Woodward of Pennsylvania to Baldwin's seat, but the nomination was rejected by the United States Senate by a vote of 20-29. Polk finally succeeded with the nomination of Robert Cooper Grier, filling the vacancy after two years. 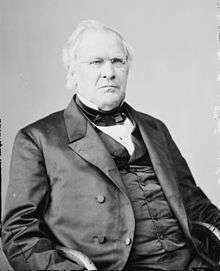 ↑ Recess appointment; formally nominated on December 23, 1845, confirmed by the United States Senate on February 3, 1846, and received commission on February 3, 1846. ↑ Because of the unique structure of the United States Circuit Court for the District of Columbia, Franklin Pierce's elevation of James Dunlop to chief judge of the Court is considered a separate appointment. ↑ On February 23, 1847, the District of Florida was subdivided into the United States District Court for the Northern District of Florida and the United States District Court for the Southern District of Florida; Bronson was reassigned by operation of law to the Northern District. ↑ On June 30, 1870, the District of Wisconsin was subdivided into the United States District Court for the Eastern District of Wisconsin and the United States District Court for the Western District of Wisconsin; Miller was reassigned by operation of law to the Eastern District. ↑ On February 21, 1857, the District of Texas was subdivided into the United States District Court for the Eastern District of Texas and the United States District Court for the Western District of Texas; Watrous was reassigned by operation of law to the Eastern District.